I am staying for two days at the Royal Foundation of Saint Katharine in the East End of London during a residential meeting of the trustees of USPG, the Anglican mission agency. Saint Katharine’s stands at the East End crossroads connecting the communities of Stepney, Shadwell and Limehouse, close to the site of the old docks. I am just a few steps from Cable Street, the scene of a famous street battle 80 years ago between Oswald Moseley’s fascists and the East End communities who protected the local Jewish people against racist taunts and assaults in 1936. This is my first time in Saint Katharine’s, which offers visitors a place of transforming calm for people who are in London on a short stay, on a business trip, or here for a personal retreat and who this as a unique alternative to London hotels. Despite these busy two days, this is a relaxing place to stay, with a peaceful environment. The garden is home to undisturbed wildlife, with blackbirds, wood pigeons in the sheltered spaces. In the rose garden, there is a rose bush planted by Queen Elizabeth II during her last visit. This setting is enhanced by the lounge, conservatory, garden and small library. The Royal Foundation of Saint Katharine’s dates back to 1147, when it was founded by Queen Matilda. Since then, this has been a centre for worship, hospitality and service for many centuries. Originally known as Saint Katharine’s By The Tower, it has been a mediaeval church, hospital and centre of Saint Katharine’s precinct, a liberty housing over 2,000 people. It once had its own courts, prisons, factories and breweries and prisons. Saint Katharine’s by the Tower – its full name was the Royal Hospital and Collegiate Church of Saint Katharine by the Tower – was a mediaeval church and hospital next to the Tower of London. The church was a royal peculiar and the precinct around it was an extra-parochial area, eventually becoming a civil parish that was dissolved in 1895. Saint Katharine’s was founded in 1147 by Queen Matilda, the wife of King Stephen, in memory of two of her children, Baldwin and Matilda, who died in infancy and were buried in the Priory Church of Holy Trinity at Aldgate. The endowment was increased by two Queens of England, Eleanor of Castile, who gave a gift of manors, and Philippa of Hainault. After a dispute over its control, Queen Eleanor granted a new charter in 1273, reserving the patronage of the Foundation to the Queens of England. This was a religious community and mediaeval hospital for poor infirm people next to the Tower of London. The foundation included a Master, six ‘poor clerks’ or priests, three brethren, three sisters and a beadswoman. Unusually for that time, the brothers and sisters had equal rights. For 678 years, the Foundation carried on its work in East London. In the 15th century, its musical reputation rivalled that of Saint Paul’s Cathedral, and in 1442 it was granted a Charter of Privileges. This charter made Saint Katharine’s and its precinct, extending to 23-acre (93,000 square metre) a Liberty with its own prison, officers and court, all outside the ecclesiastical and civil jurisdiction of the City of London. Its status as a Liberty and the fact it was personally owned and protected by the Queen Mother, meant that Saint Katharine’s was not dissolved along with the monastic houses at the Reformation. The restrictions and rules of the London City guild did not apply here, and so foreign craftsmen were attracted to the Liberty, along with many seamen and rivermen. Despite this high population density, the mortality rate in the Liberty during the Great Plague was half of the rate in areas to the north and east of the City of London. The continuing establishment of lay brothers and sisters seems to have drawn hostile attention from extreme Protestants, and during the Gordon Riots in 1780 Saint Katharine’s was saved from being burned down by the mob. In 1825, commercial pressure for larger docks up-river led to Saint Katharine’s, with its 14th and 15th century buildings and some 3,000 inhabitants, being demolished to provide a dock close to the heart of the City. The land was excavated and flooded to form a new dock. This was the smallest of London’s docks and was named Saint Katharine Docks. Saint Katharine’s by the Tower was grouped into the Whitechapel District in 1855 and became a civil parish in 1866 when its extra-parochial status ended, following the Poor Law Amendment Act 1866. The parish became part of the County of London in 1889. In 1895 it was abolished as a parish and combined with Saint Botolph without Aldgate. Meanwhile, the institution, now called the Royal Foundation of Saint Katharine’s, moved to Regent’s Park, where it took the form of almshouses, and continued for 125 years. After World War II, Saint Katharine’s finally moved back to its spiritual home in the East End in 1948, moving onto the site in Limehouse once occupied by Saint James’s Church, Ratcliff, which had been destroyed in the Blitz. It was just a mile from the original site, and the former chapel at Regent’s Park later became the Danish Seamen’s Church. The foundation was housed in the Georgian vicarage and over time a new complex has grown up around it, carefully built to preserve the sense of an oasis in the city. In Limehouse, Saint Katharine’s became a retreat house with Father St John Groser, the revolutionary Anglo-Catholic slum priest, as Master. A decade earlier, he had played a significant role in the defence of Cable Street in 1936. He was joined by members of the Community of the Resurrection from Mirfield in providing worship and service in the area, and the foundation remained under the care of the Community of the Resurrection for 45 years until 1993. In 2004, Saint Katharine’s modernised and expanded its facilities to include a retreat and conference centre, so making available its hospitality more widely within the Church of England and to other churches, charities, voluntary and public sector bodies and to associated individuals. The re-ordered chapel is the centrepiece of retreat and reflection, gracefully knitted into the fabric connecting the Georgian house with the retreat and conference centre. Last year, the Foundation opened Saint Katharine’s Precinct, a community project made entirely from shipping containers and yurts that will be recycled at the end of the project. The new facilities include a Well-being Hub, London’s first Yurt café and reflective space and artist studios in partnership with Bow Arts. The Foundation is committed to Worship, Hospitality and Service. The vast majority of meetings and conferences here benefit from subsidised rates for Church-based organisations and for the not-for-profit sector, and thousands of people stay here each year during conferences, on personal retreats, or as an alternative to busy London hotels. Earlier this year, I spent a Sunday afternoon in Portmeirion, the village built by the Welsh architect, Sir Bertram Clough Williams-Ellis (1883-1978) in 1925-1975 on the estate he inherited in Snowdonia. Portmeirion is both his masterpiece and an Italianate fantasy at one, but is also famed as the location for the television cult drama series The Prisoner, starring Patrick McGoohan, which was filmed there in 1967. But Clough Williams-Ellis also designed several buildings in Co Antrim for Ronald McNeill, later Lord Cushendun in 1927, and for the Macnaghten family of Dunderave, and I managed to see some of these on Saturday afternoon [12 November 2016] during a visit to Co Antrim that included the Dark Hedges, Gracehill House, Dunluce Castle, Bushmills, the Giant’s Causeway, the Rope Bridge at Carrick-a-Rede, near Ballintoy, and the coastal village of Cushendun. Clough Williams-Ellis was born on 28 May 1883 at Gayton in Northamptonshire, where his father, a former don at Sidney Sussex College, Cambridge, was the vicar. After attending Trinity College, Cambridge, he spent only a few months in formal architectural training before opening his own architectural practice in London at the age of 22. He first came to Ireland in 1912, when he was invited by Ronald McNeill (1861-1934), the local landlord, to design a number of buildings that would lead to redesigning the heart of the village of Cushenden. McNeill was educated at Harrow and Christ Church, Oxford, and while he was still at Oxford he married Elizabeth Maud Bolitho in 1884; He was called to the bar in 1888, but before entering on his political career, he worked as a journalist, including as editor of The St James’s Gazette (1900-1904) and assistant editor of the Encyclopædia Britannica (1906-1910). In 1911, McNeill was elected MP for the St Augustine’s division of Kent in 1911, and later he was MP for Canterbury. He was Under-Secretary of State for Foreign Affairs, Financial Secretary to the Treasury and Chancellor of the Duchy of Lancaster. In 1927, he became Baron Cushendun, of Cushendun in Co Antrim, taking his title from the village he had designed for him by Clough Williams-Ellis. He was the Acting Foreign Secretary in 1928 and he served twice as the chief British representative to the League of Nations, when Lord Cushendun signed the Kellogg-Briand Pact. Standing 6' 6" tall, he claimed he was the tallest barrister of his day. He was known to his political opponents as Lord Crush-em-down, and it is said he once threw a book at Winston Churchill in the House of Commons during a debate on the Home Rule Bill. Incidentally, McNeill and Churchill were neighbours. 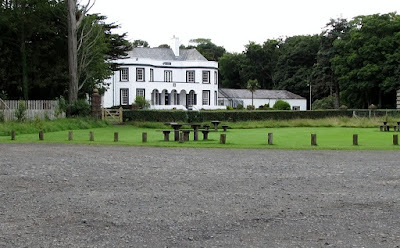 After the death of Lord Herbert Lionel Henry Vane-Tempest (1862-1921), a younger son of the Marquess of Londonderry, his estates, including the Londonderry Arms Hotel in the neighbouring village of Carnlough, were inherited by his second cousin, Sir Winston Churchill. In 1934, Churchill sold the hotel to the Lyons family. In 1930, Lord Cushendun married his second wife, Catherine Sydney Louisa Margesson. He died in Cushenden in 1934, and his second wife died in 1939. He is buried in the Church of Ireland graveyard near his nationalist cousin Ada or Ide McNeill, Sir Roger Casement’s friend and admirer, who died in 1959. McNeill first brought Clough Williams-Ellis to Cushendun in 1912 to design a hall and club. The hall and club were never built, but in 1912-1913, Williams-Ellis designed a lodge for McNeill at Glenmona House and some houses in Cushendun. Cushendun Square consists of seven two-storeyed terraces with mansard roofs and Georgian-style windows. The terraces are linked at the corners by twin arches and were planned symmetrically around three sides of a courtyard or common enclosed garden that is entered through the impressive gate piers. The houses, set firmly in the Arts and Crafts Movement, were designed to look like Cornish fishing cottages to please of McNeill’s wife, Maud Bolitho, who was born in Penzance in Cornwall. At this time, Williams-Ellis was also invited to neighbouring Bushmills, where he was commissioned by Sir Edward Charles Macnaghten and his sisters Beatrice and Helen to design the Macnaghten Memorial Hall and Schools in memory of their father Sir Edward Macnaghten (1830-1913). The hall and school opened on 4 August 1915. Vaughan Williams named his tune Magda because he wrote it in preparation for the wedding of Magdalene Fisher (1903-2002), his niece by marriage, who was about to marry the future Sir Anthony Macnaghten (1899-1972), a grandson of Sir Edward Macnaghten, on 27 February 1926. Meanwhile, however, World War I had already broken out, and from 1915 to 1918, Clough Williams-Ellis was in France and Flanders in the Welsh Guards and the Royal Tank Corps, and was awarded the Military Cross. On his return, along with other works, he produced designs for war memorials and at the same time the Bushmills Memorial School. Williams-Ellis also returned to Cushendun in 1923 to rebuild Glenmona House for McNeill after the house was burned down by the IRA in 1922. He designed Glenmona House in a neo-Georgian style, with all the mock pomposity of 18th century architecture. Glenmona House is of two storeys in front and three at the rear.The principal front has two, three-sided bows joined by an arcade on Tuscan columns. The roof is high with a solid parapet; external shutters to the windows. After Maud died in 1925, Williams-Ellis was also commissioned to design Maud’s Cottages, a row of quaint, white-washed cottages on the seafront, in her memory. This is a terrace of four two-storey houses with slate-hung upper storeys. This second group of houses were designed in the Arts and Crafts manner in the office of Wiliams-Ellis by his Dublin-born assistant, Frederick MacManus (1903-1985). MacManus was born in Dublin on 20 January 1903 and brought up in Dun Laoghaire. He was articled to Vincent Kelly for four years from 1919 while also attending evening classes given by Richard Caulfield Orpen at the Dublin Metropolitan School of Art. On completing his articles, he worked for a short time in the office of Beckett & Harrington. In 1924, he left Ireland to study at the Architectural Association schools in London, passing the RIBA final examination in 1926. In 1925-1926, he was an assistant to Clough Williams-Ellis. He then spent a year travelling in the US and Europe, during which he worked briefly in the office of the American architect WL Stoddart in New York. In 1927 he returned to London and entered the office of Sir John Burnet, Tait & Lorne, and he remained as Tait’s assistant until he joined the Ministry of Works in 1940. During World War II, he became secretary to the Committee on Building Materials and Standardisation. In 1949, he formed a partnership with Edward Armstrong with an office in Gloucester Place, London. He died on 7 May 1985. In 1932, Williams-Ellis also designed a shop in Cushendun for Mr A McAlister, a tenant of Lord Cushendun. In 1923-1937, Williams-Ellis also designed the First Church of Christ Scientist on University Avenue, Belfast. Work on this complex began in 1922, and the project included a school built in 1923, a house built in 1928, and the church built in 1936-1937. Clough Williams-Ellis was a life-long advocate and protector for the environment which led to a knighthood in 1971 for his services ‘to architecture and the environment.’ He died in 1978. The poet Moira O’Neill also lived in Cushendun and was inspired by the landscapes and the settings. She was the mother of the noted writer Molly Keane. The English poet John Masefield and his wife, Constance, a younger daughter of Nicolas Crommelin of nearby Rockport, spent many holidays in Cushendun. Cushendun stands on an elevated beach on the Co Antrim coast at the outflow of the Glendun and Glencorp valleys, off the A2 coast road between Cushendall and Ballycastle. It has a sheltered harbour and lies at the mouth of the River Dun and Glendun, one of the nine Glens of Antrim. The Mull of Kintyre in Scotland is only about 15 miles away across the North Channel and could be seen clearly from the beach and the harbour last Saturday afternoon. Since 1954, most of the village and the parkland around Glenmona to the north has been owned by the National Trust. Cushendun’s picturesque coastal setting in the heart of the Antrim Coast and Glens Area of Outstanding Natural Beauty, together with its unique architectural inheritance, resulted in its designation as a Conservation area in 1980.